Tickets Now On Sale - see you & your friends there! Be sure to 'LIKE' & 'SHARE' above to help spread the word!! Philadelphia's best red-tie charity gala has the home-field advantage this year! Join us this year at Philadelphia's own Lincoln Financial Field. Dancing, live entertainment and silent auction are just some of the experiences that you will enjoy as a guest. All funds raised support the Red Cross House - Center for Disaster Recovery and local disaster relief. For more information about Red Cross House, click here. 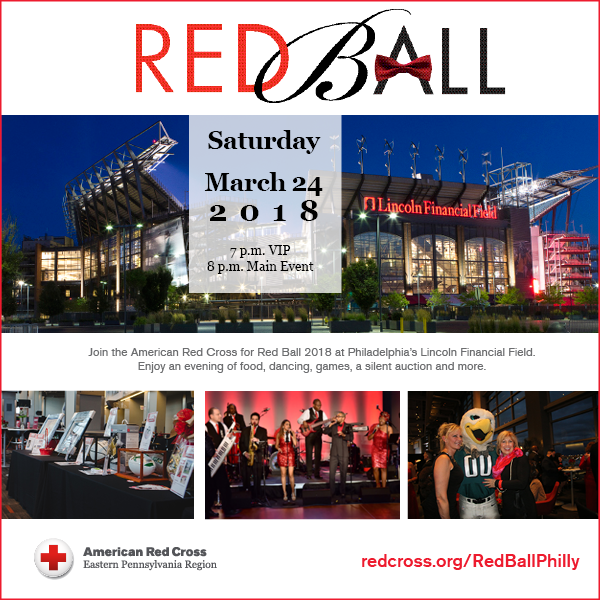 Sponsorship of Red Ball is an excellent opportunity for your organization to show its support for the Red Cross and be recognized as a community leader to over 1200 donors from Pennsylvania, New Jersey and Delaware. To learn more how about how you can become a Red Ball Sponsor, please call 215-405-8530 or click here. We are looking for Philadelphia’s Top Restaurants to participate – to learn how your restaurant can be a part of 2017 Red Ball, click here. View More Events Organized by The American Red Cross. 'Party with a purpose' when you attend this one of a kind gala at Lincoln Financial Field - SCA Club. Dancing, live entertainment, raffles, and a unique restaurant competition are just some of the experiences that guests will be able to enjoy. All funds raised support the Red Cross House - Center for Disaster Recovery and local disaster relief. This event is organized by The American Red Cross.